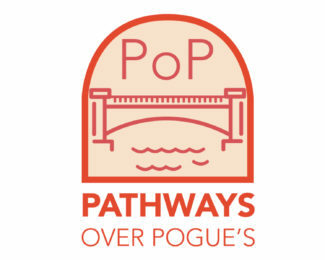 Pathways Over Pogues (POP) is a grassroots group of Near East Side neighbors that formed in the summer of 2017 to advocate for the completion of the Pogues Run Trail. The trail was part of the original Indianapolis Greenways Master Plan of 1994, but almost a quarter century later it is still unfinished. Neighbors decided it was time to step in. POP has been working with Reconnecting to Our Waterways, the City of Indianapolis, Central Indiana Community Foundation (CICF), Indianapolis Parks Foundation and private partners to seek ways to get the trail finished. One of the challenges has been that the trail includes a historic bridge just west of Rural known as the Nowland Avenue Bridge that has deteriorated to such an extent that it is becoming dangerous to use. Before the rest of the trail can be completed, the bridge must be rebuilt. But that will be expensive and time consuming because the bridge is on the Historic Register, requiring approval from multiple agencies before construction can start. This has led to an impasse for the City, which is not able to pay for a design without a clear source to rebuild the bridge as well. So neighbors were encouraged to seek alternate funding for the design as a way to get the trail going.